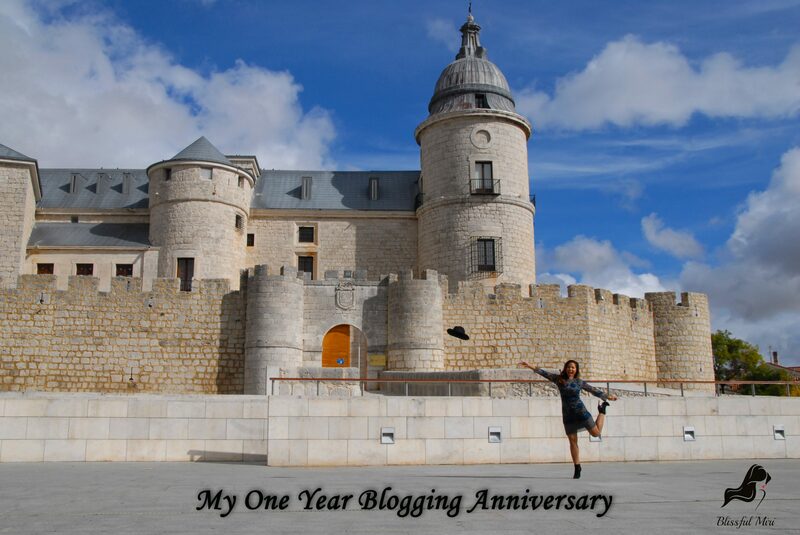 One year ago I have decided to become a travel and lifestyle blogger. I can’t believe that one year had gone by so fast! After 25 blog posts, I am very happy that I have started the Blissful Miri Blog. In the past year I have shared some of my travels, culture-related topics and my love for fashion and art in the blogging universe. 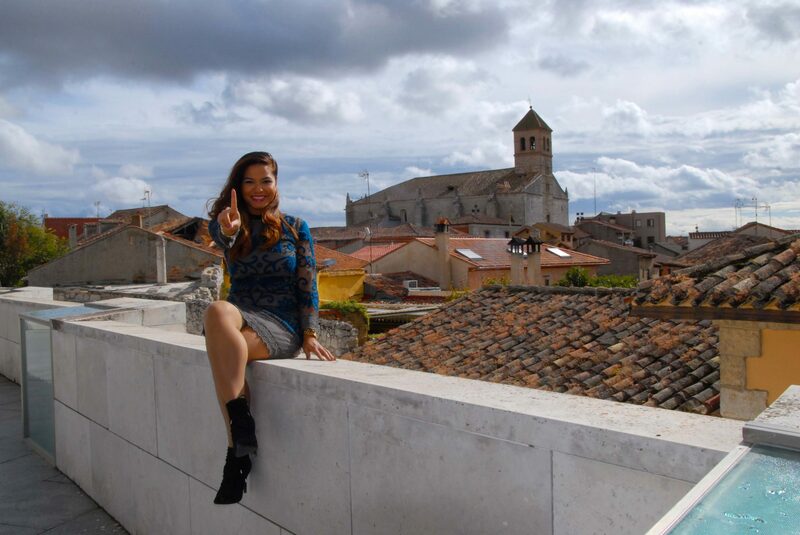 Today, I’d like you to get to know my personal side through a series of 10 questions; why I started this journey, my love for travel and where I see my blog in the future. To celebrate this special occasion, my boyfriend and I headed yesterday to a small town called Simancas (Valladolid, Spain). It was my first time visiting this place! At the Archivo General de Simancas (historical archive and Castle of Simancas); where the documents for the study of Spanish history are kept, from the end of the 15th to 19th Century. I’m 27 years-old (gonna be 28 next month, whoa!) from Bonaire (Dutch Caribbean), born a Scorpio and a Dragon (Chinese Zodiac). Many people confuse my nickname with Miriam; however, my real name is Mireille. It’s a French name, my parents named me after their favourite French singer Mireille Mathieu. Although it’s derived from Latin, miraculum, which means miracle. I think my parents also named me like this probably because they didn’t expect me. Really… I was their miracle child and only daughter (I have one big brother)! My personality traits: bubbly, free-spirited, charismatic, curious, determined and sincere. Besides blogging and travelling, I love sports! I do different workouts almost every day (I have rest days) and I lead a healthy lifestyle. I think it’s so important to maintain a well-balanced diet. My favourite sports: cardio- and weight training, Pilates, Yoga and mountain biking. I also love horse riding, although it’s impossible to do in Madrid. 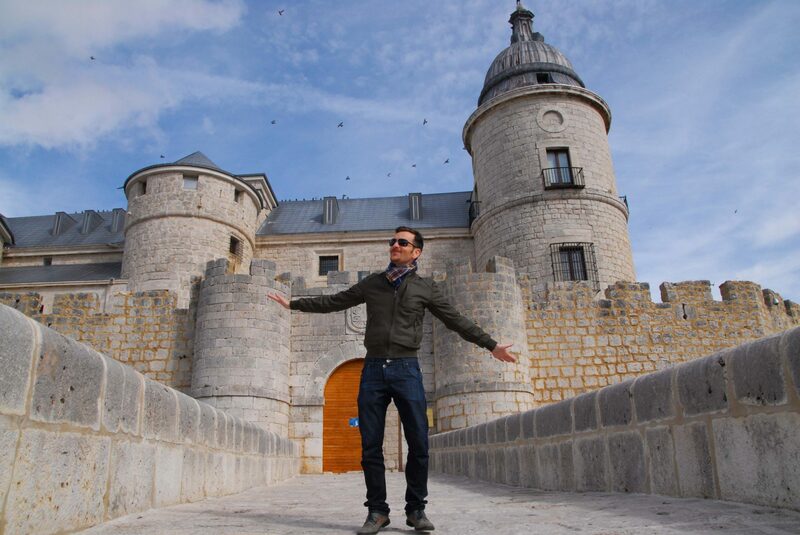 Posing near the Castle of Simancas, which dates back to the last third of the 15th century. 2) Why did I started blogging? Honestly I have been pondering to become a blogger since 2012. While I was on a 5-month study-exchange programme in Bath (UK) it occurred to me and I only created an account on Blogspot. Unfortunately, I had so many papers to write that I didn’t have the time to focus on blogging. After having finished my business studies in the Netherlands in 2013, I decided to move to Madrid. The past years I travelled all over Spain and I knew I had to share my experience via an online medium other than my personal Facebook account. And so, in October 2015 my blogging journey begun on WordPress. For me, it was an exciting and creative journey. Even though I didn’t constantly blog about my experiences, I’ve decided to occasionally share my favourite journeys, written in English and sometimes translated in Spanish (decided to take a break from translating). Posing near the main entrance of the Castle of Simancas. 3) Who takes my pictures and which cameras do I use? My main photographer is my loving boyfriend, called David, and he also checks my Spanish translations. When I travel on my own I usually take the pictures or I kindly ask someone to take the pictures of me. Cameras used: Nikon D200, Samsung Galaxy Note 4 and a Sony camera (DSC-HX9V). My boyfriend, David, showing off his dance moves! These were some of my favourite posts, because they showcase my love for travelling and my personal experiences. Be sure to check them out if you haven’t done so already. In the background you can see the Roman church of El Salvador (dating between the 12th and 16th century). 5) How do I reach my audience? To be frank, when I started blogging, my main audience was my friends and family. Later I decided to share my blog to the world! So I enabled the WordPress Reader and informed my Social Media friends (Instagram, Twitter and Bloglovin’). Now, I like to inspire everyone who’s into travelling! On the other hand, I am still learning how to attract more readers. It’s a learning process for me, and I’m enjoying it so far! 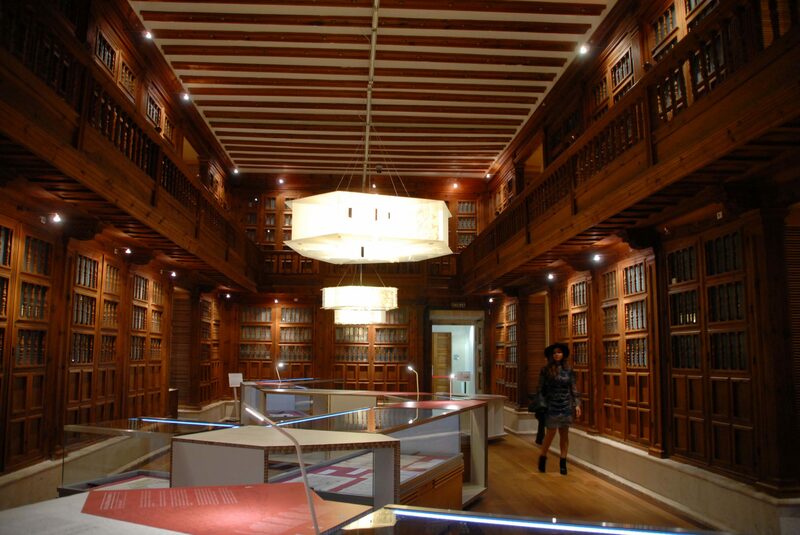 Here you can see the archival holding of the Archivo General de Simancas. 6) Where or from who do I get inspiration from? Inspiration is everywhere, you just need to look for it! When planning a trip, I must admit I do extensive research on the must-visit places on TripAdvisor or travel sites. Or I just ask the locals in the area; they’ll sometimes point you to places off-the-beaten track! It’s way more fun to be an explorer than a tourist. 7) What trips do I have coming up? I’m spontaneous, sometimes a trip will suddenly occur to me or my boyfriend will come up with an outdoorsy idea like the trip to Simancas. At the moment I do have something planned out, but it’s more work-related. If I have time, I will most definitely share the location with you. Other than that, I’m looking forward to do a girls’ trip and visit my home island (Bonaire) next year! Striking a pose in front of the Archivos General de Simancas. Bali (Indonesia). Visited this place in 2004 (also Sumatra and Java) with my family; it really connected me with my ancestral roots (my mom’s grandparents were from Java). Shanghai (China). In 2010 I was selected to be part of a 10-day study trip to China with a group of students. We also went to other cities like Hangzhou, Zhouzhuang and Suzhou. Rome (Italy). Back in 2010 I did a father-daughter bus trip from the Netherlands to Italy, we visited lake Como, Tuscany, Lucca, Pisa, Florence, Venice and Rome. New York City (USA). I visited New York twice in the past. The first time was in 2006 with my parents; we also went to Long Island, New Jersey and Philadelphia. In 2010, I won a contest by MTV to celebrate New Year’s Eve in NYC, which was an awesome experience! This is a rough estimation of the cities that I’ve visited in the past. 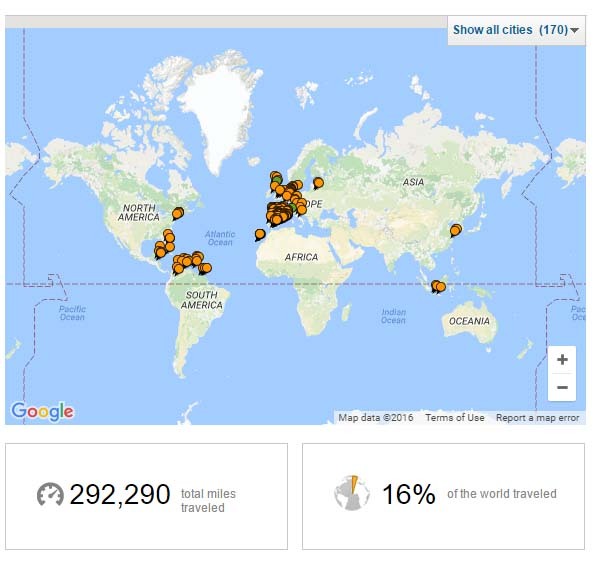 According to the TripAdvisor map I’ve visited 16% of the world, which is quite impressive! 10) How will the Blissful Miri Blog be in the future? At the moment I am very happy to read comments from readers all over the globe, and knowing that they enjoy reading my blog. It’s a lot of work and I also invest a lot of time in writing the content. At the of the end of the day I am very satisfied when I finally push the “publish” button. Moreover, I am still figuring out how to work out the online structure of my blog. It’s still a work in progress and it will also depend on my work and my personal life. From now on, I do promise to bring fresh content. Additionally, I am open to suggestions or even collaborations! Please comment below, I’d like to hear from you. Behind me you can see the Roman bridge of Simancas (build around the 13th century) and is considered to be a Property of Cultural Interest. Thanks to all of my fellow bloggers, my friends and family for being part of my blogging journey. Thank you so much Sheema and for being such a loyal reader throughout my blogging journey!! I really appreciate your kind words.